Too athletic to keep off the field, Kevin started at TE rather than play back-up to three year starter and All CIF San Diego Section First Team QB and Offensive Player of the Year Michael Coughlin (now a Quarterback at Boise State University). Kevin started over 85% of the team's offensive snaps as a second TE in a two tight end offense, or as H-Back. He was an excellent blocker and caught passes on a team that featured one of California's premier TE college prospects, Nate Chandler (now at UCLA). Blocking big defensive ends and catching passes over the middle toughened Kevin beyond the range of most quarterbacks. Rugged, durable, and not afraid of contact, he has the experience and athletic ability to avoid injury. Kevin did step in to handle the QB role in the second half of several blow-out games in 2005. Kevin had 31 starts as QB in his high school career. 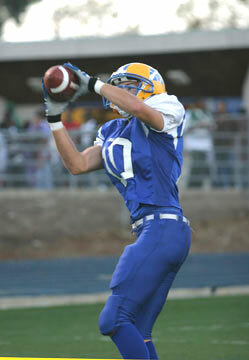 View Tight End Video (2005 Season).